Today, we’re going to take a close look at Big.One (or “Big One”, or “Bigone”, or “BigONE”, as it is variously rendered). BigOne is a cryptocurrency exchange run by god-knows-who, based in who-knows-where. BigOne has only been around since late 2017, but already supports trades with dozens of cryptocurrencies. What’s more interesting, BigOne allows trading using more cryptocurrencies than the usual Bitcoin and Ethereum. There are trading pairs with BTC, ETH, EOS, QTUM, USDT, and BITCNY. BigOne has a simple and intuitive interface that will be easy to use for anyone who has traded cryptocurrency before. Still, the questions about BigOne’s ownership and management give one pause, and might suggest that other more well-understood crypto exchanges might be a better place to take one’s business. One of those places will be eToro, which we’ll explain after we get a little deeper into BigOne. BigOne might have been started by anyone. We’ve seen rumors that one of the higher-ups and EOS started it, but there seems to be more evidence that BigOne is of Asian origin. Exhibit A: Big.One (the site) can be read in English, Japanese, Chinese, or Korean. It is, however, not available to US customers. Therefore, it seems likely that Big.One is based in Asia, or is at least geared toward the Asian crypto buying public. Exhibit B: BigOne uses BitCNY as a base currency, much like Western crypto exchanges use Tether. BigOne uses Tether too, but the inclusion of BitCNY is conspicuous, because it is a digital currency with value pegged to China’s state currency. You don’t see BitCNY almost anywhere on Western exchanges. Exhibit C: BigOne’s web copy and very name sound like English that has been translated from another source. It’s hard to imagine a Western crypto entrepreneur calling their platform “Big One”, and the website is full of chaotic phrases like the one pictured below. You read it a few times and you can tell what it probably means, but not because it makes much sense. So let’s assume that BigOne is an Asian exchange – likely Thai or Japanese. Both countries have given us excellent exchanges, but we’re not sure that BigOne can be called a great exchange. To its credit, the fact that BigOne accepts BTC, ETH, EOS, QTUM, USDT, and BitCNY is really cool. There are loads of people who love EOS and Qtum, but are unable to use them for trading without first exchanging them for Bitcoin or Ethereum. That BigOne makes them available indicates that this is a new exchange with interesting ideas, one which is sensitive to the public’s needs for versatile trading pairs. On the other hand, BigOne is clogged with crappy cryptocurrencies. BigOne adds new coins fast, and many of them are basically unheard of, trading a very low volume, or appear to be already defunct (or close to it). Any experienced cryptocurrency user knows how clunky it can be to use an exchange stuffed with filler coins. It’s a quantity-over-quality approach that characterizes exchanges lacking in curatorial acumen. We’ve also got to complain about the registration process. BigOne requests quite a lot of new users (another indication that this exchange is likely Thai), but without offering the user any kind of transparency about who that information is going to. We have to simply trust that “Big One” is good and beneficent and that it will not use our precious personal data for evil. BigOne claims to store users funds in air-gapped cold storage, which is a very good thing that more exchanges need to do. But suffering from the same lack of transparency as every other aspect of the platform, there’s no way to truly audit BigOne’s security mechanisms, and thus we just have very little to go on when deciding whether or not to entrust BigOne with our precious digital cash. At the end of the day, BigOne might be good; might be bad. Do early adopters want to risk this? We’re willing to reassess our position in a few months when BigOne has had more opportunity to prove its merit, but for now there are simply much more trustworthy exchanges which can do everything BigOne can do, and more. Sometimes the newest is not always the best. Fortunately there are a growing number of trusted financial players who are entering the cryptocurrency ecosystem, offering crypto investors a wider range of trading and speculation options than have been previously available in this industry. eToro is one of the best. eToro allows users to profit from assets like stocks and Bitcoin, without having to buy and safely store the underlying assets. If you’ve never owned crypto before, you’ve got to understand that keeping your coins safe is a tricky proposition. Users have to employ secret codes every time they buy, sell, or transfer funds. Use the wrong code and your coins are lost. Have your device hacked and your address code replaced with someone else’s? Your funds just got stolen, buddy. We’re sorry to have to let you know. eToro gets rid of all of those potential points of failure. With eToro, you don’t buy Bitcoin. Instead, you buy a contract that lets you gain profit from a certain amount of Bitcoin. If Bitcoin goes up in value, and you decide to end your contract, you get all of the extra money that this amount of Bitcoin is now worth, compared to what it was worth when your contract started. eToro is highly regulated and has an excellent reputation for security and keeping up with user interests. We have no idea what BigOne’s regulatory status is, how consistently responsive their customer service is, or whether they can last a single year without a major hack or other scandal. eToro is the perfect solution for cryptocurrency investors who are just investors. If you wanted to buy Bitcoin and spend it, eToro would not be for you, because it would not sell you the underlying asset. But it would be perfect for the person who simply wants to buy some Bitcoin, sit on it for a period of time, and sell it later when it’s worth a lot more. For these people, there’s no safer or more convenient way to invest in Bitcoin. eToro even lets users use leveraged trades, something that BigOne doesn’t offer. On the other hand, like BigOne, eToro is not available for users in the United States. For these users, conventional exchanges like Binance, Bittrex, and Coinbase may be the best solutions. We’ve already given a fair amount of information that might lead one to conclude that BigOne is not an exchange that can yet be entirely trusted. That said, there are some good things that BigOne is doing which might mean that it can work its way into the trust of the global crypto community one day. Pro. For one, BigOne’s trading fees (0.10% for makers and takers) are pretty low. They’re half of what you’ll pay at Bittrex, and equal to the fees charged by Binance, (unless you happen to use BNB, in which case Binance charges only 0.05%). BigOne has had free trading promotions in the past, but because this was the case only through the first weeks of the exchange’s existence, don’t expect that to happen again anytime soon. Pro? 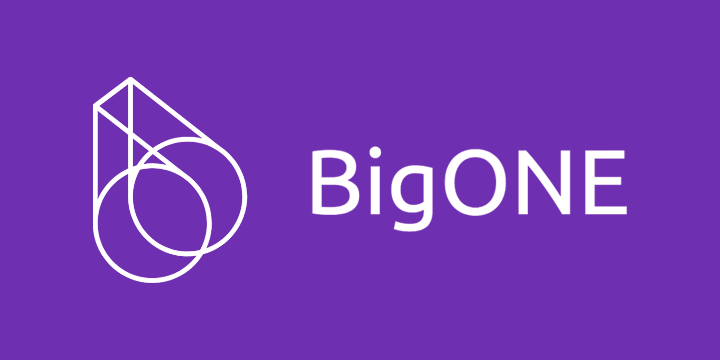 BigOne has its own utility coin, Big Token (BIG). The thing is, it doesn’t seem to do anything yet. One thread on Bitcointalk seems to indicate that BIG token is backed by…river and oceanfront real estate in Thailand. Here, BigOne says that the coins can be spent at these properties. The other use case identified is that BIG token can be used for future BigOne ICOs, a subject about which there is precious little information on the internet. Using a digital token spendable only in the physical world is a little goofy, and with no ICOs in sight, BIG has seen its value fall by almost 90% since its height just a couple of months back. On the other hand, BigOne has executed significant buybacks, a la Binance, reducing the supply for the benefit of BIG holders. This hasn’t helped the value at all, but it could. We’re agnostic as to the value of BIG token. It really succeeds or fails with BigOne, its parent exchange. Con. High withdrawal fees. It costs a fair amount of money to withdraw any currency from BigOne, a major downside for traders who would consider this exchange as a savings alternative to more popular exchanges. Con. BigOne doesn’t accept fiat payments. Not every exchange has to do this, of course. Many popular exchanges like Binance and Bittrex don’t accept fiat at all. But some of the best currencies which cater to a specific part of the world (like Bitso) have found a way to accept fiat payments, a highly necessary feature in order to bring on new user populations. Con. BigOne doesn’t appear to be regulated and it does not explain/market itself well. If we had to guess, we would say that BigOne’s Thai founders haven’t assembled a very large team. As such, certain aspects of communication, especially to the western world, have not gone well. This might not be a major issue for Americans, as they aren’t allowed to use the platform anyway, but it does close out a wide swathe of the world market to investing in BIG token, for example. Beyond simple communication breakdown, the lack of regulatory oversight can make BigOne seem like an accident waiting to happen. We’ve seen all to many middling exchanges lose massive amounts of user funds in recent months. Is BigOne doing anything to protect their users? We don’t really know. Con. BigOne new user verification takes forever. This is not a unique problem for BigOne. This writer waited some 4 months to be verified with Gemini. But this is another reason to believe that BigOne doesn’t have the staff or best practices to back up its name. Users don’t want to be “on their own” when it comes to an unregulated exchange of uncertain provenance, especially if their funds go missing. Furthermore, if it takes weeks or months to get confirmed, why would a user not just go with a competitor? Con. No anonymity, no leverage. It’s always good to have the option to trade anonymously. Anonymity, or at least the possibility of privacy, is key to the very DNA of cryptocurrency. If we’re giving away our information in order to trade, we at least want to know to whom we’re giving this information, and how they might or might not use it. This is all a mystery with BigOne, so unless you don’t care who has your personal data, think twice before giving it over to BigOne. BigOne is also without leveraged trading. This writer doesn’t touch the stuff, because it is risky, but some traders can’t do without it. BigOne is not a transparent exchange, and even though they seem to take some of the best qualities from other exchanges, they also take on some of the worst, including a totally non-discerning acceptance of cryptocurrencies to support. We like that you can buy with QTUM and EOS; we like that there’s a utility token; but there are simply too many questions and red flags when it comes to BigOne for us to possibly recommend it. Better to go with another, more trustworthy exchange. BigOne may not be a scam, but it’s easy to find better options.